Director Ram Gopal Varma’s Lakshmi’s NTR is in the middle of a controversy after Andhra Pradesh High Court ordered a stay on its release until April 15, due to the film’s content and the impending elections. However, the film has hit the screens as scheduled in Telangana and USA on Friday and you have a fair idea what to expect from this RGV and Agasthya Manju directorial. Starring P Vijay Kumar, Yagna Shetty and Sritej, the film is the third biopic about Nandamuri Taraka Ramarao (NTR), the legendary actor and the former Chief Minister of Andhra Pradesh, releasing this year. 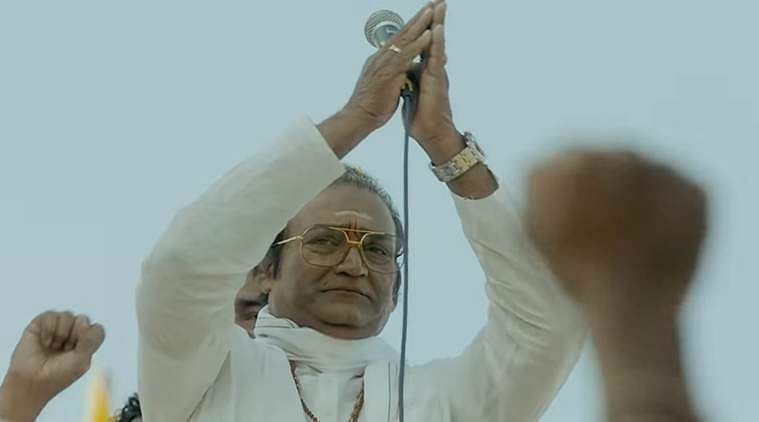 While the two other biopics —NTR Kathanayakudu and NTR Mahanayakudu — directed by Krish, and starring Balakrishna, depicted NTR’s film and political sojourn, RGV's biopic is all about how his son-in-law and incumbent Andhra Pradesh Chief Minister Chandrababu Naidu (Sritej) ganged up with his brothers-in-law and sisters-in-law and staged a coup against the actor-turned-politician thereby causing a split in the Telugu Desam Party. In the film, Lakshmi Parvathi (Yagna Shetty), who grows up idolising NTR (P Vijay Kumar), volunteers to write his biography. Impressed with her literary abilities, he readily agrees and the duo keep meeting regularly to talk about the book. NTR, who was living in a lonely life battling depression after the demise of his wife, believes that Lakshmi will fill the void in his life and approaches her with a marriage proposal. An already married Lakshmi, who also has a child, decides to separate from her husband and agrees to marry NTR. Their marriage doesn’t go down too well with NTR’s son-in-law Naidu, and the latter urges NTR to reconsider his decision for the sake of the party. However, NTR remains stubborn about getting married. Thinking Lakshmi could be a potential heir to NTR at the party, Naidu executes a plan to reduce NTR to nobody with the help of his family members, a media baron, and the MLAs. What follows is the events that led to the political coup at the Viceroy hotel in August 1995, which caused mental trauma to NTR and eventually led to his demise. RGV has presented Lakshmi’s NTR in his own style. Stories like this ring hollow and pretentious if they're not backed up by extensive research. However, it seems RGV has done enough research to make the film an engrossing saga loaded with emotions and passions. Although the film has an interesting premise, the first hour is paced slowly as the director takes his time to establish the characters and build chemistry between the lead pair. The film kicks into higher gear in the second hour with the Viceroy coup. However, the penultimate 30-40 minutes seem like a hurried hotch-potch of scenes, which have no correlation with each other. Sample this: Chandrababu says NTR kept him away from party affairs and hasn’t been on talking terms with him for verbally insulting Lakshmi Parvathi. But, that’s not the case. The climax seems stretched out with a lot of melodrama. Portraying a broad spectrum of emotions, and playing a character whose arc ranges from powerful leader to a victim of circumstances, Vijay Kumar impresses with his power-packed and nuanced performance as NTR. He looks very natural and acts with great ease. Yagna Shetty plays Lakshmi with all her heart, especially in the scene where she breaks down while reading an article in a newspaper about her alleged influence in NTR's decisions and projecting her as his potential successor. The film is also powered by Sritej’s finely-calibrated performance as Chandrababu Naidu. Despite its sluggish pace, Lakshmi’s NTR, which traverses the unexplored events that happened in the life of NTR, makes for an interesting watch.